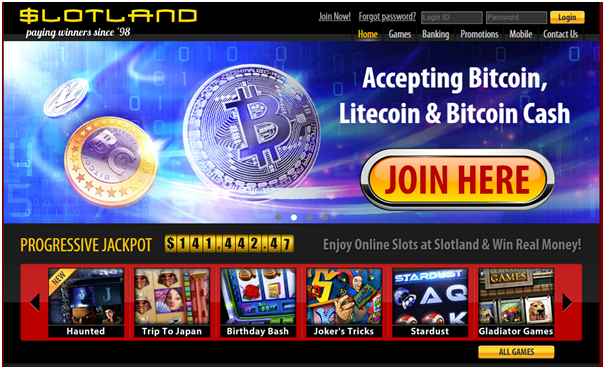 Slotland casino is the perfect Bitcoin casino that allows US punters to play wonderful slots with Bitcoins, USD and other cryptocurrencies. You can choose any gaming device to get started be it Windows PC, Mac, iPhone, iPad, Android cell phone or tablets. This online casino is not new but has a good reputation since its launch in 1998. Being a legit casino registered by the Government of Anjouan, the casino is safe to play as offers encrypted secure online transactions. The casino offers huge variety of slots games and as the casino name suggests it is really a land of slots to enjoy anytime without any download. 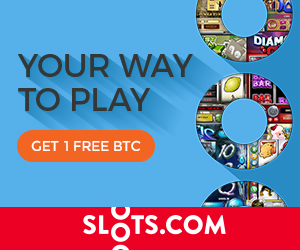 Slotland Casino uses its own proprietary software, and offers great selections of progressive jackpots slot machines, 3D slots, table games, Video Pokers and more to enjoy in simple format. You can indulge in online slots titles like Gold the Riches, Alice in Wonderland, and Phantom of the Opera. While they could definitely add some categories to sort the games, there is the added bonus of most games sharing one progressive jackpot. What is most interesting in this casino is that every single one of the video slots games contributes to a single progressive jackpot. This means that every one of Slotland’s players have a chance of striking it lucky with a massive win. There are also special deposit bonuses for high-rollers, exclusive VIP offers for top players, mobile casino promotions, and various other prize offers. Not only are the slots games offered here but also sci-fi flavoured variant of the traditional game of blackjack, and several poker-style card games including Jacks or Better, Striking Sevens, Wild Heart, Four Cast, and several others are available. 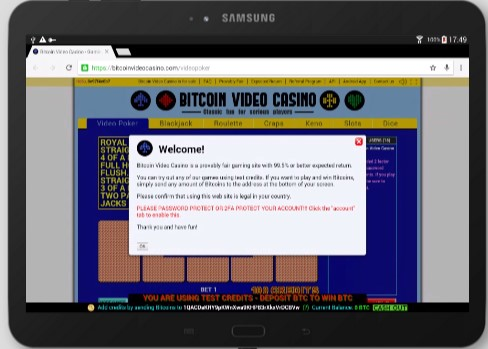 More new slots and their titles are added frequently to enjoy instantly to play in real time with any of your gaming device with Bitcoins. To create an account, simply click on the “Join now” button, fill out your information, select the preferred currency of your account, and select “Sign me up”. Fill out your profile information upon registration. If at any point after registration you wish to modify your information– simply click the LiveChat button, and one of Customer representatives will be more than glad to assist you. For real money play make a deposit which is minimum $10-$25 at the cashier. 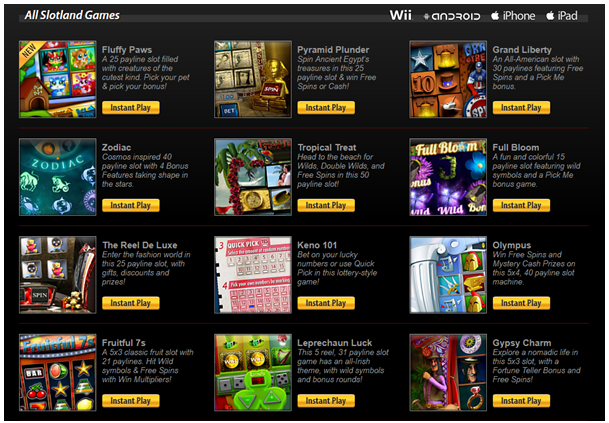 Collect the instant bonus Choose the game you wish to play by visiting the games lobby and now start playing the games. 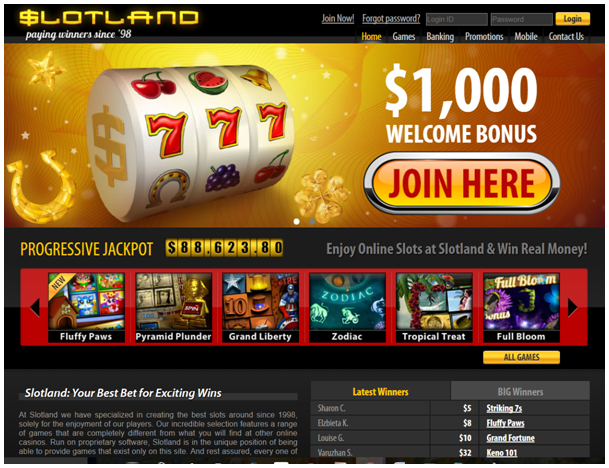 Slotland offers a standard welcome bonus with ongoing promotions for existing customers such as an automatic US$100 free on every US$1,000 deposit. Additionally, for every $20 you deposit, you get one ticket into a draw for that week. The lucky winner gets a $500 bonus deposited into their casino account. Thus very low wagering requirements on bonuses. 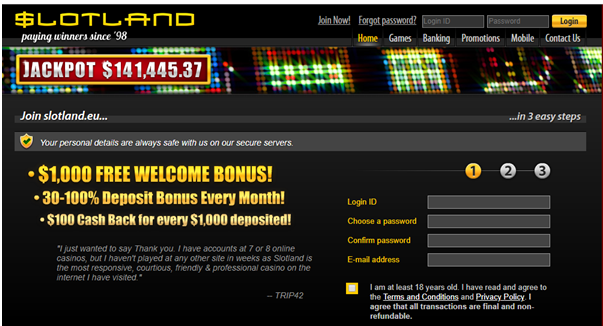 The casino will match your first ten deposits with fantastic welcome bonuses. Use the bonus codes below to redeem your bonuses that range from WELCOME1- WELCOME10 with 100% match bonus on first deposit and rest nine deposits fetch you 50% match deposit bonus. 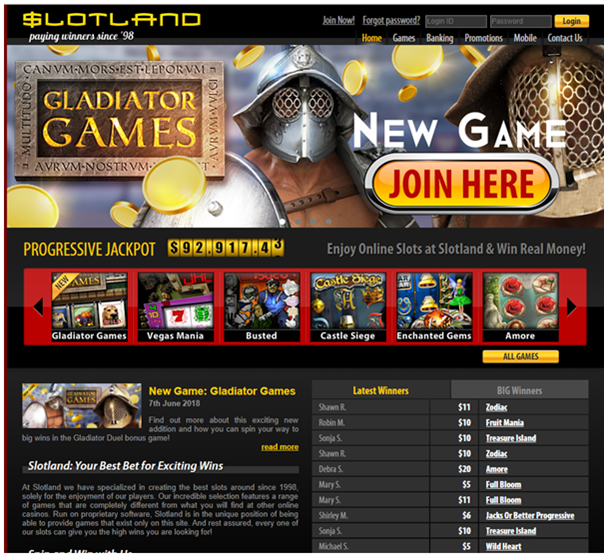 The Slotland newsletter also gives out mystery deposit bonuses every month. The minimum is 30%, and the maximum is 100%, but you have to be a newsletter subscriber to qualify for these. VIP players get more and can win a 45%, 75% or a 150% reload bonus every month! Also grab the weekly bonus and you automatically enter the weekly draw for prizes worth $1,500! For every dollar you deposit in a particular week, you earn one ticket toward the free draw. Each ticket you earn drastically increases your odds and gives you a better chance at winning. Get free $100 for each $1,000 where you receive a 10% cashback bonus whenever your deposits reach $1,000. All you have to do is deposit and play regularly for this bonus. 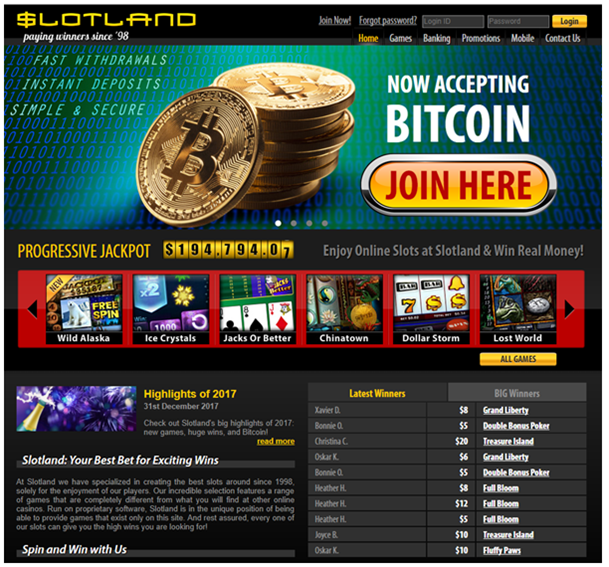 At Slotland you will find various mode of deposits right from major credit cards including Visa and MasterCard, eWalletXpress or Instadebit, Neteller, Moneybookers, Litecoins, Bitcoin Cash and Bitcoins, all of these payment methods register instantly. You can use USD, BTC, LTC currency to make the deposit. When it comes time to withdraw your winnings, you can use any of the alternate methods. Additionally, you can request a wire transfer or a cheque. In the event that you win over $5000.00, special arrangements must be made for cash withdrawals. Then you can email at billing@slotland.eufor more details. Also the casino offers 24/7 customer support to players. The casino comes in two languages mainly English and Spanish. The customer support at the casino is wonderful and prompt. You can contact the support team directly via four different emails: info@slotland.eu (for general issues), billing@slotland.eu (billing issues), support@slotland.eu (technical issues) and mobile@slotlandeu (mobile issues). You can also instantly connect with the help staff with a live chat.